Watch this video of Chicago PD addressing the charges against Jussie Smollett. Note how the speaker accuses Jussie of damaging Chicago's reputation, and says nothing about the actor's real victims: MAGA Trump supporters. For weeks he accused his political rivals of the assault. Yet the policeman wholly evaded this issue and acted as if Jussie was some blight on Chicago. Nobody cares that this happened in Chicago. That's not the point at all. 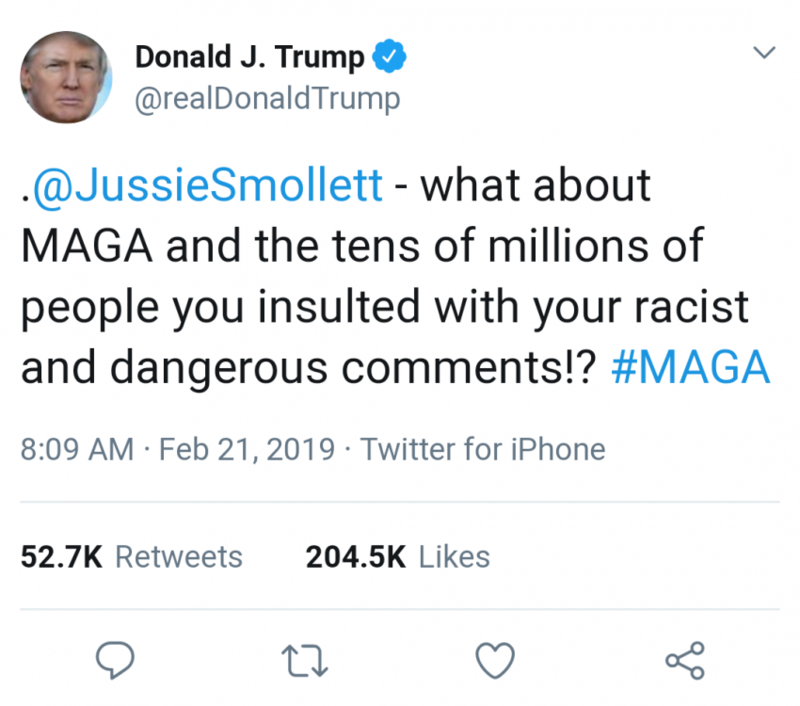 Also, he says Jussie perpetrated the hoax over dissatisfaction with his salary. So not only is this about Chicago over MAGA, it's about salary over racism. These political cops in Chicago are ridiculous, and they will get skewered by the political right. actor's real victims: MAGA Trump supporters﻿. Come on man, troll a bit better than this! I think it would've been more fun to connect Obama to this. I don't troll. 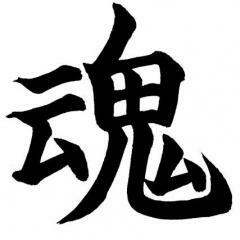 I always say what I believe. If you have an argument, make it. Jussie all along blamed MAGA dudes. He tried to slander Trump supporters in general. They are the real victims. If Jussie had blamed Ayn Rand fans all along, would you still be calling me a troll? I doubt it. It would have been obvious that we were the victims of his hoax. Yes, cowardly racists are the real victims here. Everyone knows they wouldn't actually have the balls to act out their beliefs. Only thing they can do is hide behind a hat with the initials for a meaningless catchphrase on it. It's so clever of them. What a great social movement this trumpism is. Just out of curiosity: what exactly is the Chicago PD supposed to do to help these poor victims you've been hanging out with? Free high speed Internet into their moms' basement for life? "So there is a mad scramble over who is the victim here. Who is the victim? Well, there is one. What Smollett did was not a victimless crime. There is no such thing as that. An entire group of people did get slandered by this hoax. Regular people from outside the coastal cities. People with the wrong political beliefs and the wrong skin color. 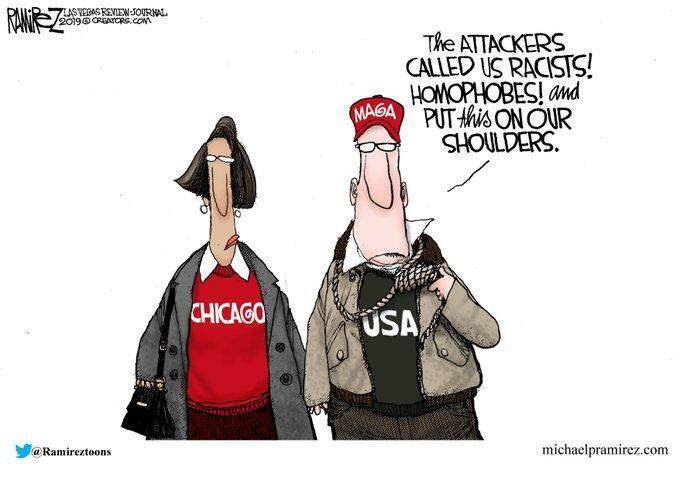 Smollett and his many defenders savagely attacked these people and they are not apologizing for doing it. Instead they are telling you -- you hear this everywhere -- that the real losers here are the authentic victims of hate crimes who won't be believed the next time. OK. That's fine. But what about the innocent Americans they just poured venom on for two weeks because it matched some bigoted stereotypes they had about Middle America? What about them? There is no mention of them." You don't exactly need to be a genius to figure out the real victims in this case. In a broad sense anyone who took Jussie seriously is a victim of his lie. But more narrowly Jussie made this about politics and race, so in that sense his victims are the political opposition he generally slandered. An entire group of people did get slandered by this hoax. Regular people from outside the coastal cities. People with the wrong political beliefs and the wrong skin color. No one got slandered. Indeed, people might overgeneralize (two guys who wear a MAGA hat therefore mean all people who like Trump would do the same thing), but that isn't slander. That's people being obsessed with identity politics. He didn't target anyone, he didn't lie about someone in particular, he didn't make a false accusation. I'm sure he developed the scenario specifically to get as much attention as possible, but probably the only people who fell for it were those who already have an aneurysm as soon as they hear MAGA. Tucker Carlson loves identity politics just as much as a liberal. Only if you believe in collective victimhood, can you construe this as someone being victimized. He﻿﻿ didn't target anyone, he didn't lie about someone in particular﻿, he didn't make a false accusation. Tell that to his two friends whom he's trying to frame, to this day, for committing a hate crime attack. If Jussie had his way, they would be facing criminal charges, not him. I don't think the hoax went according to plan, though. If his friends weren't discovered, Jussie would've continued using his victimhood as a political weapon against Trump and "MAGA country," as he did on the Good Morning America interview. He paid them to do it, and they did willingly, so he didn't frame them. Scapegoat, maybe, ("it was their idea!") but that's not framing. It would be scapegoating if Jussie blamed them for the crimes that he actually did. But that's not what he's doing. He's not blaming them for staging a hoax or filing a false police report. Instead he's falsely accusing them of a real hate crime, which is something he himself did not do. There was no hate crime against him. Yet he has been providing "evidence" for one. Now he's even challenging his friends' story that the check was payment for the hoax, claiming it was only for a fitness program. So it appears he was a little clever in how he paid them. And he still maintains his original story, which makes this an attempted framing after the fact to save his own skin. The police aren't completely stupid, though, so it probably won't work. I'm asking because I don't know anything about him maintaining his original story still. I'm not that interested in the story because it's pretty stupid in terms of the whole situation, but I'm curious enough to read an article if you have it. I'm asking because﻿ I don't know anything about him maintaining his original story still. I'm not that interested in the story because it's pretty stupid in terms of the whole situation, but I'm curious enough to read an article if you have it. That's from after Jussie got arrested and still maintained that he didn't do it. His story has not changed. And now his lawyers apparently plan to use some old, "homophobic" statements made by one of the two brothers, in a further attempt to paint them as hate criminals. The Chicago Tribune editorial board is pissed. Jussie Smollett must have some friends in high places. Some friends whose names rhyme with "yo' mama."